Here are answers to frequently asked questions and links to get additional support. Learn how to control Angeldust using a keyboard and mouse, a touchscreen or a game controller. check if no family members are heavily using your connection. 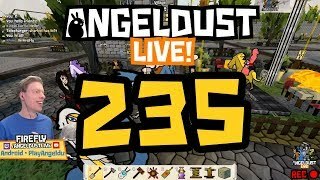 Watch Angeldust Live!, in which Angeldust creator Frank "Firefly" Lucas plays live and answers your questions. Chat, watch and play along! Browse previous episodes and highlights. Also pay a visit to our player forums and support page. Android is a trademark of Google Inc. Apple, iPad, iPhone and macOS are trademarks of Apple Inc. Steam and the Steam logo are trademarks and/or registered trademarks of Valve Corporation in the U.S. and/or other countries. Wi-Fi is a trademark of Wi-Fi Alliance. Windows is a trademark of Microsoft Corporation.